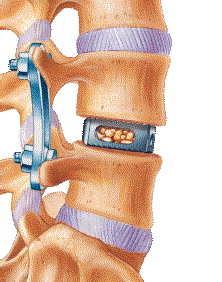 Lateral lumbar interbody fusion is a procedure in which the surgeon accesses the affected vertebrae in the lower (lumbar) back through the patient’s side, rather than through the abdomen or the back. This surgery is a less-invasive procedure designed to spare the muscles, tendons, ligaments, and other tissue from the major disruption associated with traditional open back surgery. The purpose of this surgery is to alleviate the symptoms associated with impinged or irritated nerve roots or the spinal cord. This operation is considered “less invasive” because the incision or incisions are generally much smaller than the 5-inch or longer cuts typically used in open back surgery. The period of recovery varies from patient to patient, but most can expect to resume normal activity within a few months. The LIF procedure does not require entry through sensitive back muscles, bones, or ligaments. The end result is less operative pain. 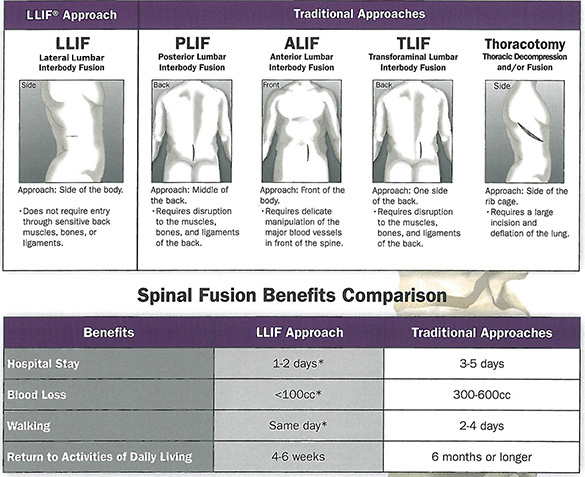 LIF allows for complete disc removal and implant insertion, compared with approaches from the back. When compared to ALIF, where the surgeon enters from the front, the LIF procedure reduces the risk of vascular injury. Reduced operating time: Traditional procedures can take up to 5 hours; the LIF procedure can be successfully completed in as little as 1 hour, reducing the amount of anesthesia time. Reduced blood loss and minimal scarring: The less-invasive LIF procedure allows for less tissue disruption, resulting in reduced blood loss. Reduced postoperative pain: The LIF procedure does not require entry through sensitive back muscles, bones, or ligaments. Reduced hospital stay: Patients are typically capable of walking the same day after surgery and require only an overnight stay in the hospital. This is compared to several days of immobility and hospitalization typical of traditional open surgeries. Rapid return to normal activity: For LIF, a patient is typically fully recovered around 6 weeks, compared to 6 months or more. 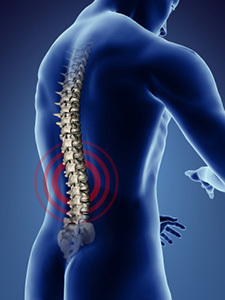 Relieve your pain: call (866) MY-SPINE and schedule an LIF consultation today with Dr. Siddiqui!